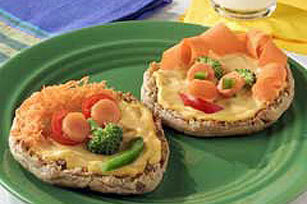 Who knew an English muffin, a little CHEEZ WHIZ Cheese Dip and some veggie toppers could combine so hilariously—and deliciously! Serve these fun sandwiches with 1/2 cup apple wedges and a hot cup of tomato soup prepared with milk for a complete meal that has 450 calories, 15g of fat, 16g of protein and 68g of carbohydrates per serving. See who can make the funniest face on their sandwich. Try broccoli florets or shredded carrots for the hair, bell pepper strips for the mouth and pitted ripe olive slices or cherry tomato halves for the eyes. Serve these sandwiches with cut-up fresh fruit. For a fun way to serve the fruit, skewer the fruit pieces on lollipop sticks or plastic coffee stirrers.